· Respiratory Problems: asthma, bronchitis, sinus congestion, laryingitis, tonsilitis, and other respiratory system problems. · Improve Digestion: Can help with colic, vomiting, and flatulence. The most common preparation from lavender is as an essential oil from the species Lavandula angustifolia, commonly known as English or common lavender. There are 39 species and most have similar applications. However, because it's most commonly used and studied, this article refers specifically to L. angustifolia, unless stated otherwise. The oil is used both for its scent and as a topical application. There have been claims that the oil is allergenic to some people when applied to the skin. However, many of those instances appear to be focused primarily on incidents of a single chemical that can be isolated from lavender, rather than from the oil itself. Single chemicals isolated from plants can prove to be dangerous when their symbiotic effects in coordination with the whole plant material are safe. Linalool and linalyl acetate have been isolated and called the active ingredients. 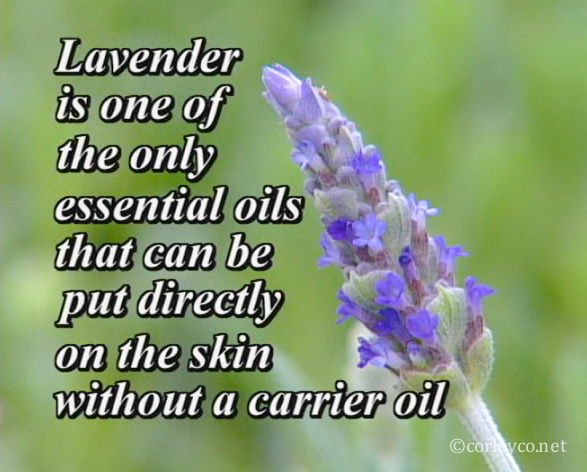 However, the effects noted here are associated with lavender oil, not chemicals isolated from it. MRSA, methicillin-resistant staphylococcus aureus, is becoming commonplace. It originated in hospitals as a result of overuse and misuse of antibiotics and has become symbolic of out-of-control mainstream medicine. The disease created by antiobiotics used for treatment of staph infections is often far worse than the original. A large number of studies have demonstrated lavender oil's ability to treat both staph infections and MRSA. Most commonly, L. angustifolia has been used. However, at least one study looks at three other varieties, L. latifolia, L. stoechas, and L. luisieri. It found them all effective, but also noted that combinations of different varieties appeared to provide even better curative ability. Most exciting, though, is that lavender oil has been found 100% effective in lab testing to treat some infections, including MRSA. That means it could be used to treat staph infections that drugs can't touch. That, of course, begs the question of why hospitals let people suffer and die, rather than trying natural products proven to be effective, such as lavender oil and manuka oil. Though the range of bacteria that succomb to lavender oil is not known, many do. If you wish to try it, first be sure that you aren't allergic to it by applying a bit of oil on normal skin. If you don't have a bad reaction—and very few people do—then simply apply the oil to the infected area. Fungal infections can be among the most difficult to treat, and can be fatal, especially in immunocompromised people. The fungus Candida albicans normally lives in the human gut, forming a symbiotic relationship with us. It rarely causes problems unless the balance of gut fauna is disturbed—which commonly happens when antibiotics are given. It's the cause of both yeast infections in women and thrush, which is C. albicans in the mouth. Vaginal yeast infections can be treated with a douche made with a tea of lavender blossoms. Because of the low concentration, though, it may require several applications. Better yet, drink tea made from lavender flowers as soon as you realize there's a likelihood of getting an infection, such as when taking antibiotics. Nail fungal infections and athlete's foot can readily be treated by applying lavender oil. Lavender oil used for its aroma, as in aromatherapy, has been documented to improve heart health. It reduces inflammation, which is associated with heart disease, by inhibiting cortisol. Blood flow, measured as coronary flow velocity reserve (CFVR), is increased, thus providing better oxygenation, nutrition, and waste removal to cells. These benefits were found by using 4 drops of essential aromatherapy lavender oil in 20 milliliters of hot water, and then inhaling for 30 minutes. L. angustifolia has long been used as a digestive aid. It improves the motility of intestinal tract, allowing food to pass through more readily. Gastric juice production, including bile, is increased, which improves digestion and nutrient absorption. Colic, vomiting, and flatulence have all been helped through the use of lavender. Lavender improves motility of intestinal tract. It stimulates production of gastric juices, including bile, and can help with colic, vomiting, and flatulence. An interesting benefit is that lavender gently inhibits the growth of pathogens, but according to one study, it doesn't harm beneficial bacteria. How it distinguishes between harmful and beneficial bacteria is a mystery! As a digestive aid, lavender oil can be taken as a tea. Lavender has long been noted as a relaxant and aid for mild insomnia. Its use for this purpose is generally through aromatherapy application. Inhalation of lavender oil scent has been used successively in geriatric patients to replace sleeping pills. Patients slept just as long and their sleep was of a better quality. Their daytime wakefulness and alertness were significantly improved, and no adverse effects were reported. A small clinical trial that covered 245 nights of elderly patients found that those who received lavender oil scent slept much better. Of those who received lavender oil, 72% slept well, while only 11% of the controls did. It's difficult to see why anyone would take a sleeping pill without first trying lavender! Mix these three essential oils together and use as aromatherapy. Because of its ability to relax nerves, lavender has been used to calm coughs and ease breathing in colds and influenza. It's used in inhalers and vaporizers, or simply dotted on the neck or chest. As we've seen in lavender as sleep and respiration aids, it's a natural nerve relaxant. That, of course, is its most famous use. Study after study has documented its benefits in a wide range of related applications. It's excellent before and during tests to ease anxiety. It even improves cognitive function, which can result in better grades! Lavender has been used to calm aggressive geriatric patients with dementia. A study of 15 severe dementia patients compared lavender oil aromatherapy with placebo. The majority of patients (60%) showed mild easing of their agitation, 33% showed no change, and 1 patient (7%) was aggravated by lavender. When attempting to use lavender for its soothing and calming effects, it's advisable to test first to see if the affected person might respond in a contradictory manner. Some studies have shown—and some people have reported—that lavender has an ironic opposite effect on nervousness, anxiety, and relaxation. When used in a dentistry office, lavender reduced anxiety and improved moods. It's been shown to improve cognitive ability, improve moods, and the effects show up on EEG patterns. Endocrine stress markers in saliva are reduced with use of lavender aromatherapy. Depression levels and insomnia were reduced in college women. Instead of taking that antidepressant your doctor's been pushing on you, why don't you try a little lavender aromatherapy? Research into lavender for pain relief is limited, but what little exists is showing some benefit for chronic pain patients. It has been shown to have some benefit in after-surgery pain. One study of lavender oil aroma used in conjunction with acupuncture demonstrated easing of back pain. It seems rather obvious, though, that a substance that can induce relaxation and ease anxiety would also alleviate pain. Whenever a person in pain can be helped to relax and reduce stress, then pain tends to ease, also. One of the most amazing effects of lavender oil is its ability to reverse hair loss in alopecia areata, an autoimmune condition in which hair follicles are attacked as if they were a foreign invader. It causes a great deal of emotional stress in its victims, and the allopathic treatments are very risky. Steroids can result in terrible and permanent adverse effects, including diabetes, thyroid damage, and many other diseases of the autoimmune and endocrine systems. Treatment of alopecia areats with lavender oil is simple. Just rub it in on bald spots. Be patient, as it can take several weeks to show benefits. Also, be cautious at first to assure that there is no allergic response. Be aware that it doesn't seem to work in anyone, but there don't appear to be adverse effects beyond allergic reactions in a small number of people. 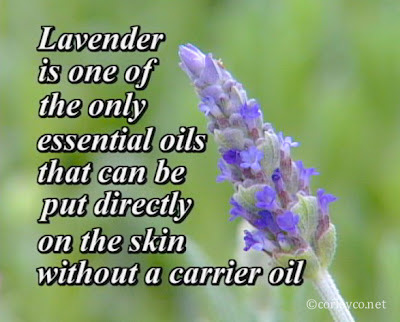 Many skin conditions have benefited from treatment with lavender oil. Eczema often responds. In general, if you wish to try it, the rule of thumb is to be cautious. Remember that we all respond differently and a few people have allergic responses. So, go cautiously. If you find that it benefits you, then use the smallest amount possible to effect a cure. Otherwise, you may sensitize yourself to it. All of the effects of lavender add up to one single, and documented, benefit: strengthening the immune system. Used as a tea or a dilute solution in a lotion or oil for routine topical application may improve your overall health health and wellbeing, which can help prevent illness. Lavender is a most gentle and health-producing herb. Nonetheless, we are losing access to it as a health product. In the EU, lavender is treated as a drug and will soon be unavailable without a prescription in all, or most, European countries. The UK's list of approved herbs does not include a single version of lavender. Gaia Health will soon bring you an update on the UK's current list. It's eye-opening to see just how limited the public's direct access to natural health products is becoming. Lavender is just one of many.